FTSE for FRIDAY #Cac40 #Dax The #FTSE is driving us a bit crazy. For the market to successfully escape the immediate downtrend since last August, it required CLOSE January above 6,977.225 points. The index closed the month at 6,968 points, close but no banana! However, during the trading day, the market did exceed the trend, creating the situation where movement now above 6995 points allows continued recovery to an initial 7060 points. If exceeded, our secondary computes at a longer term 7235 points. What happened on the final day of January is liable to prove significant. Essentially, the UK index confirmed the downtrend we’ve been keeping an eye on is actually valid, if we judge the unwillingness to close the month in “safe” territory as important. 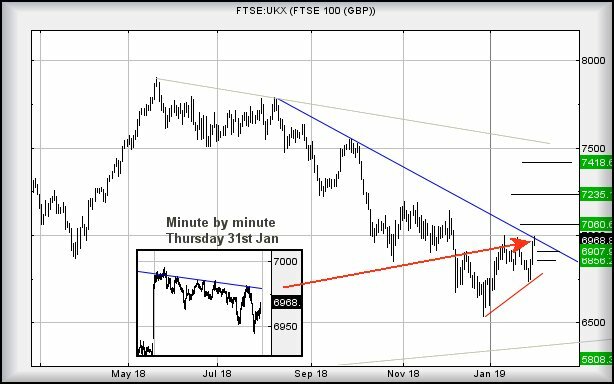 On the chart below, we’ve shown an inset with market moves literally minute by minute during the session, these confirming the close attention paid to the immediate BLUE downtrend since August last year. Essentially, it means our fabulous UK Govt is not yet free and clear – something most people already suspect. For an enhanced chance of any near term relaxation being viable, the index requires weaken below 6930 points, this making traffic down to a tame looking 6907 possible. Our secondary, should such a level break, calculates at 6856 points. Neither drop ambition is particularly spectacular, the market requiring below 6770 presently to break RED, once again kicking its way into a zone where the 5,800’s awaits on the immediate cycle. Even then, there’s the important matter of the uptrend since 2009 which a present is lurking at 6380 points and we’d be amazed if it were not to intrude were anything to provoke a severe drop.